I recently wrote that a fat frequent flyer account is one of the many benefits of extensive foreign travel. Another one (at least for me) is collecting all those entry and exit stamps that fill up the visa pages in your passport. Even in this day and age of digital technology, every time you cross a border, a border agent stamps your passport to show your port of entry (or exit) and when you were there. Over the years, your passport gradually turns into a jumbled-up journal of your foreign travel—full of tiny, sometimes colorful souvenirs of where you’ve been. As you can imagine, since meeting my French husband back in 2009, I’ve gotten quite a few passport stamps from French passport control. And for every one of them stamped at Charles de Gaulle, I have a corresponding one stamped by American authorities at Dulles or Charlotte. 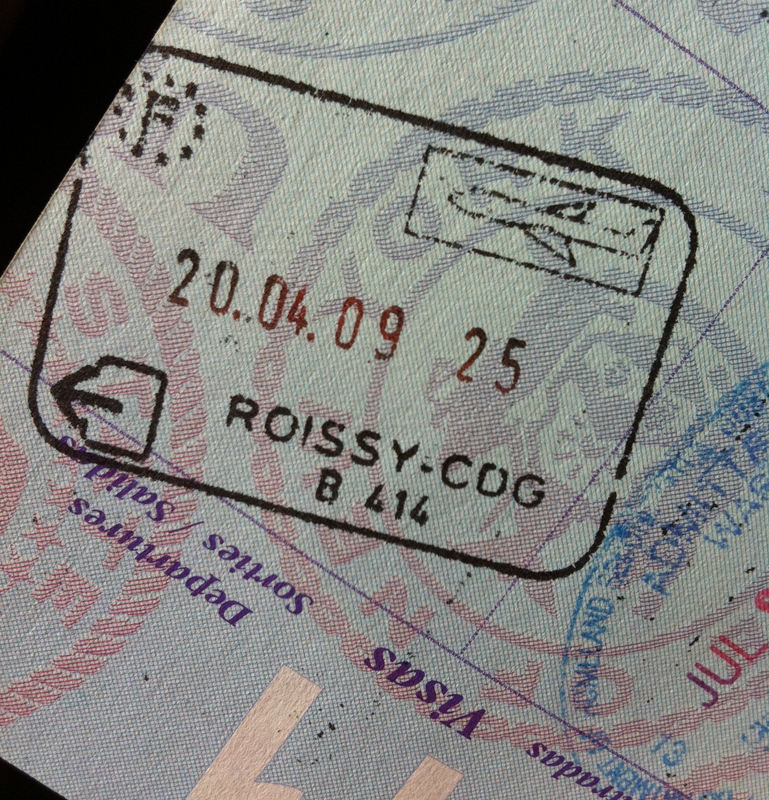 As an expatriate, though, it’s not just entry and exit stamps that decorate my passport: I even have two entire pages taken up by my initial student visa issued by the French Embassy in Washington and my first residency permit issued after my arrival in France by the Office Français de l’Immigration et de l’Intégration. Just flipping through my passport, in fact, you see more French than English. My stamps aren’t limited to French and American ones, though. I do have an eye-catching one in vivid green from a trip I took with my mom to Ireland in 2006, as well as a few British ones I got at Gare du Nord in Paris before taking the Eurostar over to London. What I don’t have, unfortunately, are stamps from Belgium or Hungary, my other two international destinations since getting my current passport. Since both countries are in Europe’s Schengen Area, you don’t even have to pass border control if you’re coming from another country in the Area—like France. That’s really too bad. It would have been really cool to have one in Magyar … or even Dutch. The rub with all this stamping is that you only get 24 visa pages in an American passport. Now, that sounds like a lot since each page (the old style, at least) had 4 little boxes for stamps. Technically that gives you 96 passport stamps during the 10-year life of your passport … maybe even more since most passport control agents are pretty sloppy about placing their stamps. When you travel as much I have, though, and you’ve got other big things like visas and residency permits pasted in there, you can run out of room before it’s time to get a new passport. If you don’t want to order a new passport yet, just order new visa pages! 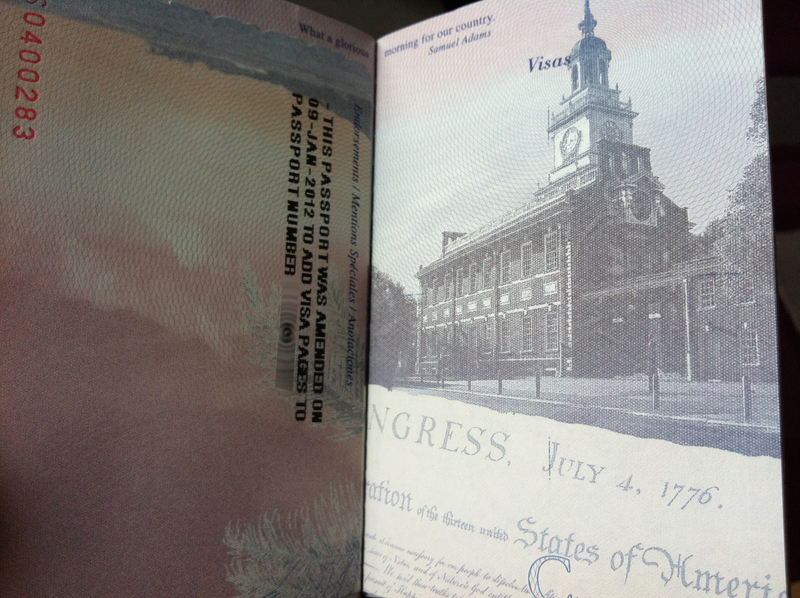 American passport holders can order up to two 24-page inserts that are affixed in the passport by the National Passport Center, or by the local consular officials if you’re living abroad. Late last year, when I realized that I was quickly running out of room in my passport that was valid for another 2-1/2 years, I figured I’d just take a trip to the Embassy one afternoon and ask for new pages. Of course, it’s never that simple! It turned out that I had to fill out an application and mail my passport to the Embassy. Now, I’m a little skittish about putting something as essential to my immigration status as my passport into the mail system … even the French mail system. No worries! The Embassy requires you to use something called a Chronopost envelope for both sending the passport and getting it back. It’s very secure and traceable—kind of like FedEx, but more expensive … a lot more expensive! Little did I know when I walked into a French post office last Thursday afternoon that each Chronopost envelope costs 22.50€! That meant that just mailing the passport to the Embassy right here in Paris (just 5 miles from where I live) and getting it delivered back to me was going to cost about $60! On top of that, the fee for the visa pages themselves was $82. Oh well, at least that’s not as expensive as my residency permit was … oh … wait a minute. Yes, it is! Of course, you might be asking why I didn’t just spring for an entirely new passport that would be good for 10 more years for the bargain basement price of $110. Good question. After all, my passport photo is of me about 25 pounds ago! The truth be told, I’m already having buyer’s remorse about my decision to just get visa pages, but here’s my story and I’m sticking to it: It has something to do with the fact that my residency permit is linked to my current passport number. Maybe I’m wrong about that and getting a new passport wouldn’t create a problem with the French immigration system at all. If you’ve been following my story here, though, you know that I don’t have any desire to open that can of worms just yet! I’ll just wait until 2014 to worry about that, thank you very much! In any case, in what may be a record of bureaucratic efficiency, I got my newly made-over passport in the mail today … just 3 business days after sending it! Now, it’s off to enjoy my 24 brand spanking new visa pages! Where should I go? Somewhere outside the Schengen Area so I can get some use out of them, I guess … or I could just look for flights with connections through London or Dublin! For more information about renewing your passport or ordering visa pages, visit the website of the United States Embassy in Paris.